P1 = Stock Price after First time period. 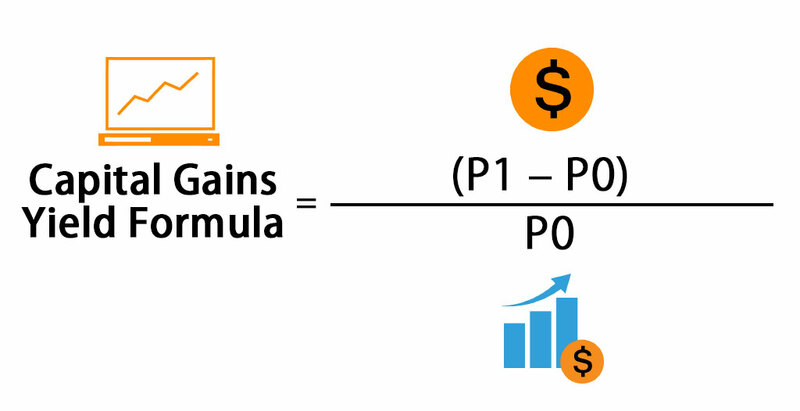 The formula of capital gains can be stated as the ending price divided by the initial price minus one. 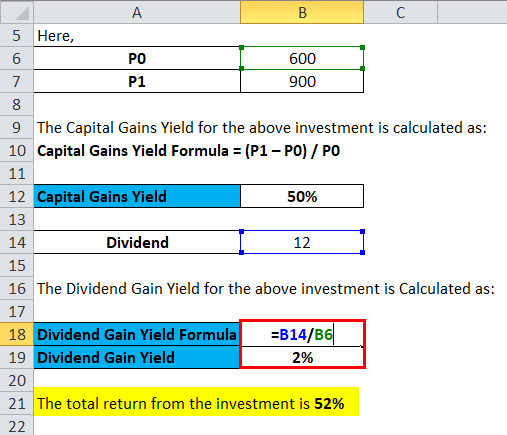 Again the alternative formula is a rearranging of the capital gains yield formula shown earlier. 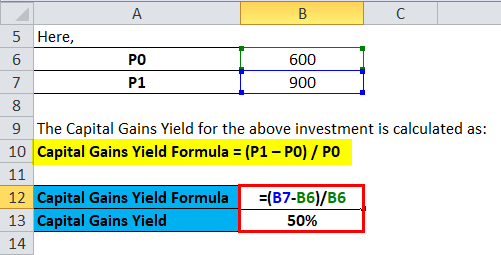 Capital Gains Yield Formula = Delta P / P0. Capital games yield denotes the absolute return of a stock based on the appreciation of that particular stock after purchasing. The formula of capital gains yields is calculated by excluding the dividend paid by the stock. The dividend yield can be calculated by dividend yield formula. Combining capital gains yields and dividend yield we get the total return from this particular stock. Capital gains it is primarily used to calculate the rate of change of the stock price only. The rate of change can be found by subtracting the end amount from the buying price and then divided it by the original amount. Rajesh bought a share of Marico Ltd @ INR 600 on 1st January 2015. At the End of the year, the appreciated by 50% and the stock price was quoting at INR 900. Marico has announced a dividend of INR 12/ share during the end of the calendar year 2015. Calculate the Capital Gains Yields. Mr. Jagmohon bought TATA Steel Limited on 1st April 2017@ INR 550/ share and sold @ INR 450 on 31st December 2018. TATA steel has allotted a dividend of INR 2/ share during the period. 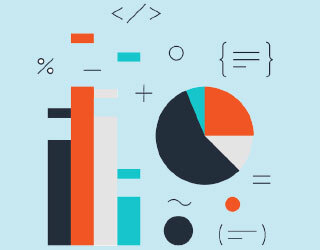 Calculate the Capital Gains Yields. Since Mr. Jagmohon sold TATA Steel at a loss of INR (550-450) or INR 100, there has been no capital appreciation and there is no capital appreciation in the Books of Mr. Jagmohon. So the Capital yield formula is not applicable here. TATA Steel has announced a dividend of INR. 5.5/ Share during that period. Again, as the dividend does not comprise a substantial portion of the stock so there is no scope of capital appreciation too. Thus the capital Yield formula is not required. Note: There might be a situation where there is no announcement of dividend by the particular Stock and thus, Dividend yield ratio will not be valid at that point. 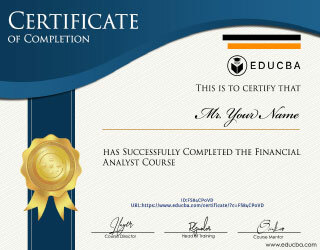 Yami wants to see how much she has earned on a particular stock only on the basis of capital appreciation/depreciation. She has seen that when she has bought the stock, the price was INR 100. Now, after 2 years, the price of the stock has appreciated to INR 200 per share. What is the Capital Yield on that particular stock? The requirement of capital yield formula used when there is a change in the buying price of a stock and with the selling price of the particular stock within a one-year time frame. When a stock price appreciates and the holder of the stock sales at a premium price and the difference of the amount is entitled to a short-term capital gains tax. 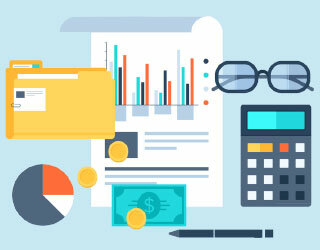 The calculation of capital yield is done by subtracting the buying amount from the ceiling amount and dividing it by the buying amount multiplied by 100. Thus we get capital gains yield at absolute percentage terms. If security cannot generate a positive return that is the selling price is higher than the buying price then there is no point of capital gains. There might be several instances where the dividend healed ratio is higher but the capital gain is Nil. Again or stock may deliver lower dividend yield but there might be a capital gain. In that cases, the stock price reflects the company’s growth instead of getting it distributed through a dividend. For each and every investor capital gains used to be one of the prime aspects in calculating the premium value received against a stock. If there is a good growth story by the company then the stock price will reflect a premium price and the appreciation is being reflected by through the stock price. In practice, most of the companies don’t pay dividends in spite of higher profitability growth in each and every year. The undistributed dividends get compiled within the profits of the company. Thus the price of the stock denotes the absolute return in form of the stock price. Thus there is no dividend yield ratio for the investor. Show all the growth of the company is being reflected from the appreciation of the stock price in the stock market. Thus the absolute capital gain yield can only be reflected through the difference in buying price and selling price of the stock. You can easily calculate the Capital Gains Yield using Formula in the template provided. Dividend yield and Capital gains yields are required in case of appreciation of a stock price. A growing business in most of the cases gives a scope of capital appreciation for the shareholders. 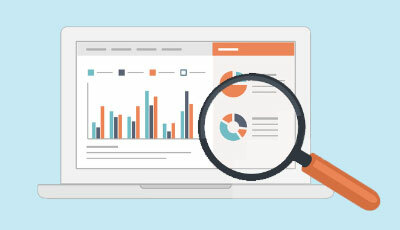 Yields refer to the profits generated after selling a particular stock at a premium price over a period of time-based on the invested amount and is measured by the excess cash flow received by the investor after investing on security. 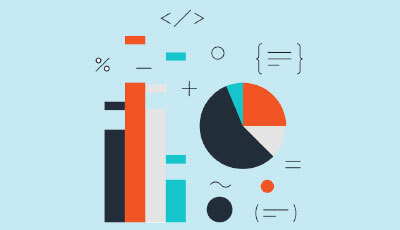 In most of the cases, a yield is computed on yearly basis and in extreme cases yields are calculated on a half-yearly and quarterly basis.